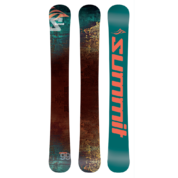 Introducing the new Summit CRZ-Trick 106 cm Full Rocker 3D Skiboards GR. These CRZ 106 skiboards are true all mountain, all condition skiboards. 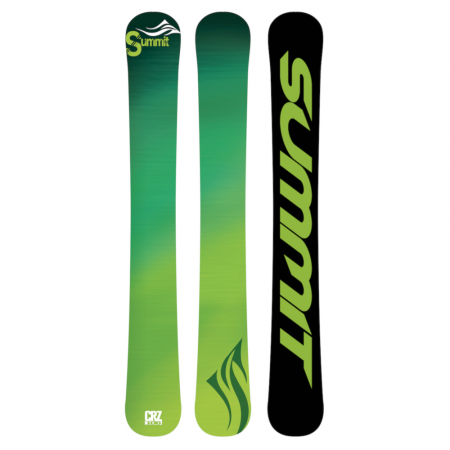 Introducing the new Summit CRZ-Trick 106 cm Full Rocker 3D Skiboards GR. These CRZ 106 skiboards. These Rocker/Zero Camber skiboards are true full rocker skiboards. These have zero camber making them a similar profile to hockey skates, allowing easy spins, playing in the moguls and especially the terrain parks. Great in powder as well. 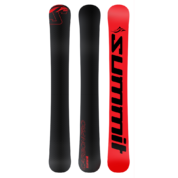 Summit CRZ-Trick 106 cm Full Rocker 3D Skiboards GR offer a unique combination of 15% Rockered front tip, 0% camber and 15% rockered tail. If you love super short turning ability, these are the ones. yet may encounter powder conditions, these are the skiboards for you. What does this mean? It means riding through soft snow is an almost effortless ride, feeling more like surfing! This unique combination of Rockered tips and tails deliver fast turn initiation, a super short turning radius as if riding something much shorter. Excellent in the terrain parks and for playing on the mountain, even snow dancing. This Rocker/Camber combination also gives you multiple sweet spots to explore throughout the length of the skiboards. These rockered skiboards feature 4 stainless steel insert allowing the use of Snowboard bindings like the Technine Custom DS Snowboard Bindings. These can also be mounted with release bindings like the Atomic L10 or FFG12 bindings. 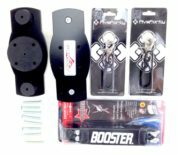 We premount the release bindings for you and include free wide brakes. These Summit CRZ-Trick 106 cm Full Rocker 3D Skiboards GR are full on symmetrical twin tips (for those who love to ride or land jumps backwards). The tip-to-tail Northern Birch/poplar wood core provides a super smooth flex allowing you to truly enjoy your ride every time coupled with the wide body construction and fast sintered bases that offer surprising speed. These will definitely bring a smile to your face all the way down the run. Ready to play? Tuning: These come fully tuned with a free hand hot wax. Rocker/Camber Design: a unique combination of Rocker/Zero Camber construction — 15% rockered in front with 4 mm rise, 15% rear with 4 mm rise and 0% camber. This makes for super easy turn initiation, excellent float in powder, a very short turn radius and provides stable carving at speed. Great in terrain parks.